Edit: yes a rescue was contacted while I was standing in front of the puppies but I did not hear back until then next morning. Several more have also gotten involved & we're trying to locate them now. These dogs were here from 9am and never moved until I left at 4pm. Edit #2: there are a lot of people who can't seem to believe that the Amish do this or are convinced that this is just a singular case. The truth is that majority of puppy mills in high Amish populated states such as Pennsylvania, Ohio, New York, and Michigan are Amish owned and operated. Mama dogs are forced to be bred one litter after another and are usually shot when they can no longer reproduce. 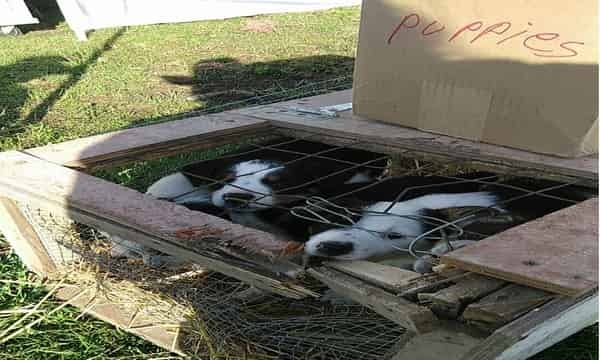 Both Mama dogs and puppies are typically kept in rabbit hutches their entire lives until either sold or killed. This picture and video was taken when the puppies were being showcased off for sale which sadly makes their current conditions substantially better than they usually are. Even after being rescued or bought, most Mama's and puppies cannot walk after living on metal wire and not having enough space to move their whole lives. This is done solely for profit with no regard to the dogs health, whether physically or mentally, and is a huge factor in the overcrowding of shelters and most who buy a puppy mill dog expect a low maintenance happy family pet and do not expect the inevitable health and mental issues that stem from these living conditions. The best thing everybody can do is to never give puppy mills your money. Contact Bucky Buckland via this link for help, thank you. 2 Responses to "very cruel: puppy mill in tiny broken crate dried in the sun with no water all day long"
Please contact Mill Dog Rescue--perhaps they could help and also Humane Society of the US investigates cruel puppy mills--keep trying to get them closed down--it is disgraceful. They look upon dogs as livestock. The Amish are know for their horrible cruelty toward their animals, with horses getting the worst. Can’t believe these living among the Amish have allowed this to go on for so long.